This week I was having a conversation with a client who’s building a new home. For those of you unfamiliar with this process, typically clients set up a design appointment where they select all the finishing’s, where each addition up from builders grade could be a pretty penny. So, stretching your budget and knowing where and when to spend your money is important. For example, these clients had to choose between an aluminum framed shower door, or glassless for their master, of course at an additional cost. In a case like this, my design advice says to absolutely spend the extra here. 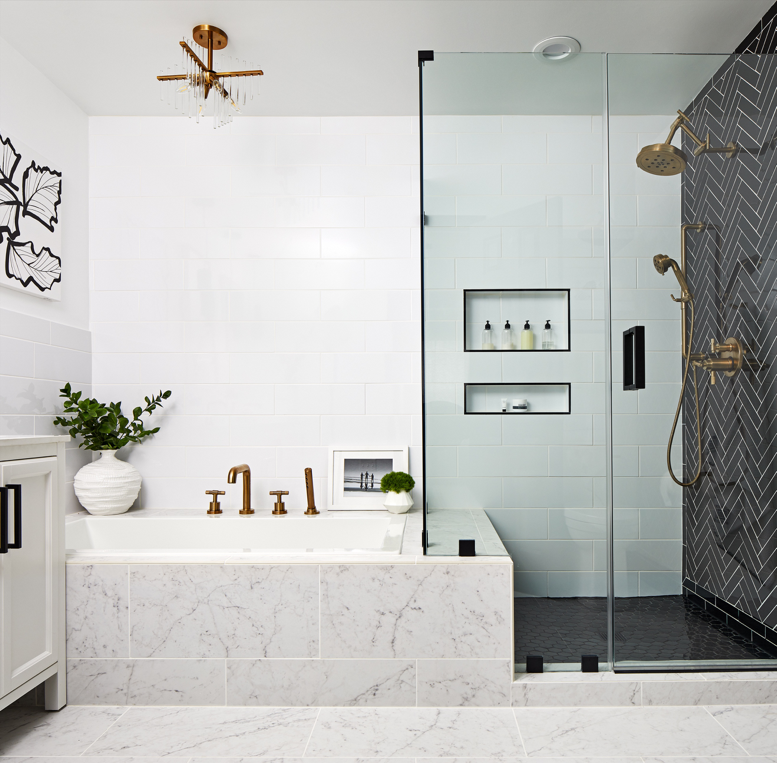 By choosing glassless doors, you allow yourself to open up your visual field- like in my master bath– which allows you to showcase the fabulous tile work in your shower (as well as encourage you to keep your shampoo and soaps organized!). To ensure my design vision and shower we’re taken care of properly, I got in touch with Dulles Glass. Not only did they come in and get the work done- they delivered and installed an amazing product! If you don’t believe me, scroll down and appreciate my master bath once more! Absolutely no guessing whats behind those doors! Now imagine this shot with an aluminum frame right in your face-No thanks!